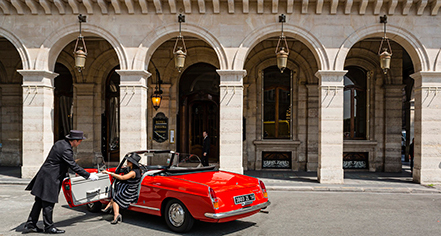 Within sight of the Tuileries Gardens, just moments from the Parisan icon and treasure, the Louvre, Hotel Regina Louvre offers the ultimate in French sophistication and decadence. Surrounded by all of the finest offering of Paris, this Art Nouveau property is firmly anchored in the history of Paris that's reflected in its interior's intricate woodwork and designer lighting. Opening its doors in 1900 for the World's Fair, the Second Empire property was constructed on the site of the Louvre Palace's royal riding stables. Offering 99 accommodations, including 32 suites, many with views of the Eiffel Tower, Louvre, or Tuileries Gardens, Hotel Regina Louvre is an exquisite travel back into the times of Belle Epoque and its aesthetic-minded lifestyle that is evident in the rich fabrics and romantic furnishings throughout the hotel. 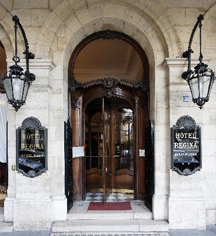 Hotel Regina Louvre, a charter member of Historic Hotels Worldwide since 2011, dates back to 1900. Kings Henry III, Henry IV and Louis XIII learnt how to ride in the hotels former grounds – when it was a riding school. Hotel/Resort Fees & Taxes: Resort Fee: Please contact hotel for more information. Taxes: A tax is imposed by the city: EUR 3.30 per person, per night. Parking: Valet parking: Available; surcharge. Within sight of the Tuileries Gardens, just moments from the Parisan icon and treasure, the Louvre, Hotel Regina Louvre offers the ultimate in French sophistication and decadence. Learn more about the History of Hotel Regina Louvre .